I spent Christmas with my best friends, and it was amazing. I commented that I have been doing things that I never would have done before and I think that it’s part of a rebellious phase I am in, to which Alex replied that I am not in a phase at all – I have rebelled my whole life. He’s so right. That being said I am pushing my own limits. 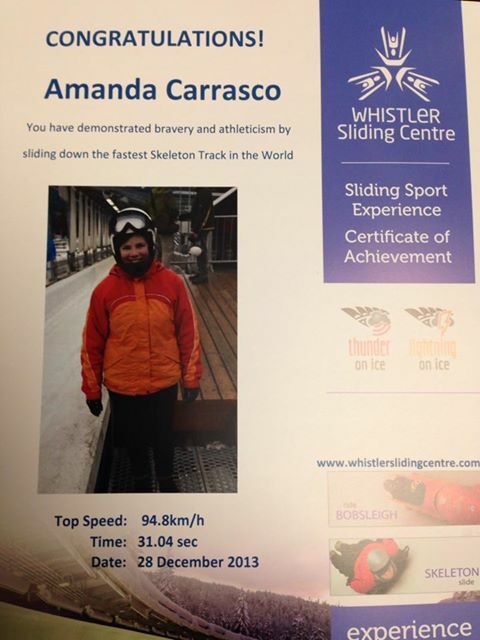 Last weekend in Whistler I sled down the fastest, steepest and most technical track in the world – head first. It’s this crazy thing called the skeleton. Before my first run I tried not to think much about what I was doing. Then on the run I just about peed myself. It started out slow and gentle but in seconds I was traveling at 94.8 kms per hour. In the orientation their safety tip was to “act like a sack of potatoes” – I am totally serious. Who says that? I am going to admit tears escaped my eyes that were in addition to the ones produced by the 3g force of turn 16. When it was over I had to sit down. I was in shock. This was like a roller coaster on steroids and then some. I don’t like roller coasters. You pay for two runs and the staff wondered if I would do my second. Everything in me said walk away (I was not capable of running), turn for your life and escape! And I said of course I am going to. I am sure my body face palmed on the inside. They asked if I liked it and I said no, they laughed. I was terrified to do that again but I realized that given the current season of my life, I am not holding back for anyone. I make the decisions I want and it’s all up to me. The only thing holding me back is myself. It was exactly this situation here. I really didn’t think I was going to die, possibly get very hurt if I did something stupid but for all intensive purposes this was a calculated risk. The only reason I would have said no to the second run is fear. I just would not let fear win. I have made, and stuck, to some of the hardest decisions of my life in this season. I will not let fear hold me back. It doesn’t mean the fear leaves once I make the decision, it just means I don’t listen. The time I had to wait for my second run felt like an eternity. It was awful and I felt like I was waiting for the executioner. We had to change out my sled because it just didn’t feel right, which was probably more me than the sled. Then I started sliding down. The second run was very different than the first. I knew I would pick up speed quickly and I was ready for it. I knew what the turns felt like. I left some of my fear on that track. I still had tears when I finished and I still had to sit down after the run – I don’t think my body likes g force.